Mkambati Nature Reserve is a coastal wilderness area characterised by, beautiful waterfalls, rivers and rock features, wooded areas and a swamp forest. 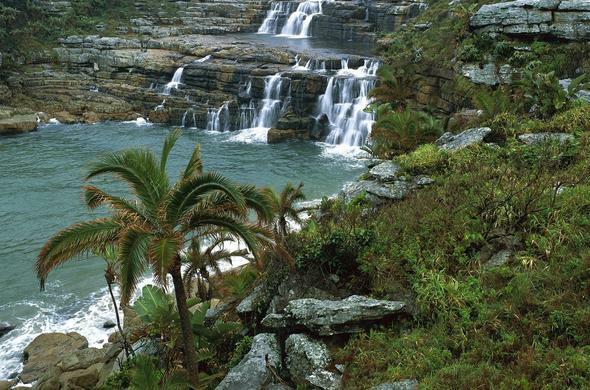 Mkambati is the jewel of the Wild Coast game reserves in the Eastern Cape. It is about five hours from Durban and two to three hours from Umtata. Situated between the Msikaba and Mtentu rivers, this 8 000 hectare coastal reserve has beautiful open grasslands, indigenous forest patches as well as swamp forests. These habitats provide shelter for a large number of herbivores such as Eland, Red Hartebeest, Blue Wildebeest and Blesbok and an amazing variety of birds such as croaking cisticola Gurney's sugarbird and the enormous protected ground hornbills.A colony of Cape vultures inhabits the magnificent Msikaba Gorge and there is an excellent hike that goes to the cliffs below. Very special to this centre of endemism is the Pondo coconut Jubaeopsis caffra which is only found on the north bank of the Msikaba and Mtentu rivers. The Msikaba River is navigable by boat for about two hundred metres from the river mouth.Hiking or riding horses are the best ways to experience this incredibly beautiful reserve. A number pretty streams tumble through the grasslands and spill out onto the pristine beaches and a series of waterfalls, Horseshoe Falls, Strandloper Falls and Mkambati Falls drop off over terraces, with the river eventually crashing down into the ocean. There is a natural amphitheatre with breathtaking views of the Msikaba gorge, towering evergreen forests and rolling grasslands that descend down towards the beach. Mkambati is also one of the better places from which to observe the anual Sardine Run.Many, many years ago Mkambati was a thriving missionary village with a couple of churches, village shop and post office. Most of these buildings are now abandoned and it is interesting to hike among the trees to find the ruins. Although there is no campsite there is a variety of accommodation options ranging from fully equipped self-catering stone cottages that sleep six people, to a magnificent stone lodge that sleeps 12.The lodge overlooks the sea, but also has its own swimming pool and an enormous lounge with fireplace and a cook. GweGwe is a fishing camp right on the edge of the sea, but is very rustic and provides only the absolute basics, so visitors need to take their own bedding, cutlery and crockery. Riverside is a massive rambling house on the river that takes a minimum of 12 people and maximum of 20. Apart from provisions, everything is provided.